What to use your serial mouse for? I didn’t even know that I still had one. 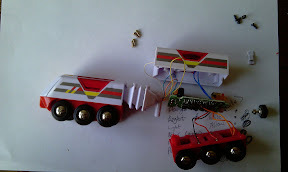 Last week my two year old son decided to test the crash resistance of his brio train. The outcome: broken train. I decide investigation was the best option, after removing the base of the front section of the train there appeared to no issues with the drive equipment. Then I tried the motor using an alternative power supply, this worked. Next I removed the rear cover to see if there was any visible damage to the inside. Having removed the rear cover it became apparent that the flexi joining of the front and rear sections of the train was staining the solder joins for the wires connecting the front and rear sections – take note those that use Flexi Buses! The wiring had become detached and at some points the wire had disintegrate. There was one solution that would work: replace the wires with new ones. They needed to be flexible enough to take the strain and yet be fine to fit in the flexible connector. After a search in the loft I found a serial Microsoft mouse, rather dusty but fully intact, including even the ball. After a moment’s hesitation, after all it was a perfect specimen with, I guess with some historic value, however in our house there are no computers with serial ports and no one that uses a mouse, removal of the tail was the best option. 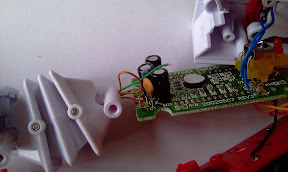 I stripped off the outer coating and found that the wires were ideal size to replace the damaged wires. The new wires were attached to the damaged wiring and were pulled through the connector. All that was now required was reassembly. My first attempt failed because there remained some damaged wires, the strain of the reassembly damaged the remaining wires. Therefore I had to repeat the procedure for the remaining wires before I was able to get a successful repair. 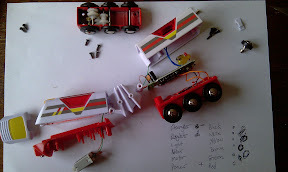 The successful reassembly was popular with my children. The time commitment compared to the replacement cost left my wife thinking replacement may have been a better option. And I am left trying to get my son to understand that crash testing of trains may not be the best way to play with his toys. Especially where it involves dropping them from anywhere that constitutes a great height.